Our base is located within an area of Woodseats Methodist Church. Your first meeting will last about 1 hour. On arrival for the first time, you will be offered light refreshments and then given an opportunity to discuss your current situation with the counselling lead - Ian Wainwright. From the discussions, an initial plan will be agreed with you, together with the costs and availability of appointment times etc. You will then be offered a contract for you to consider in your own time. There will be no pressure on you to agree with anything until you are ready to do so yourself. The cost of this initial meeting will be £40. When you agree to further sessions, dates and times will be given to you at this point. Our aim is ensure that are made at ease through out this process, and understand what and how the therapy might help you. Where appropriate, personal home visits can be organised and these would be agreed at the initial consultation meeting. Counselling South Sheffield can visit your workplace should you wish us to. For this to occur, it is important that your employer is in full agreement for us to visit, so before any therapy can be discussed, Counselling South Sheffield will first agree all costs, times and a suitable therapy area relative to the needs of the business. When this has been agreed, the therapist will then be able to see you in your place and proceed with initial introductions and discussions around current need. This process will be conducted by the counselling lead - Ian Wainwright. At your initial meeting, a contract and plan will be offered to you for you to consider in your own time. If you agree to further sessions, dates and times will be given to at this point. Our aim is ensure that are made at ease through this process, and understand what and how the therapy might help you. Counselling South Sheffield use therapeutic resources. 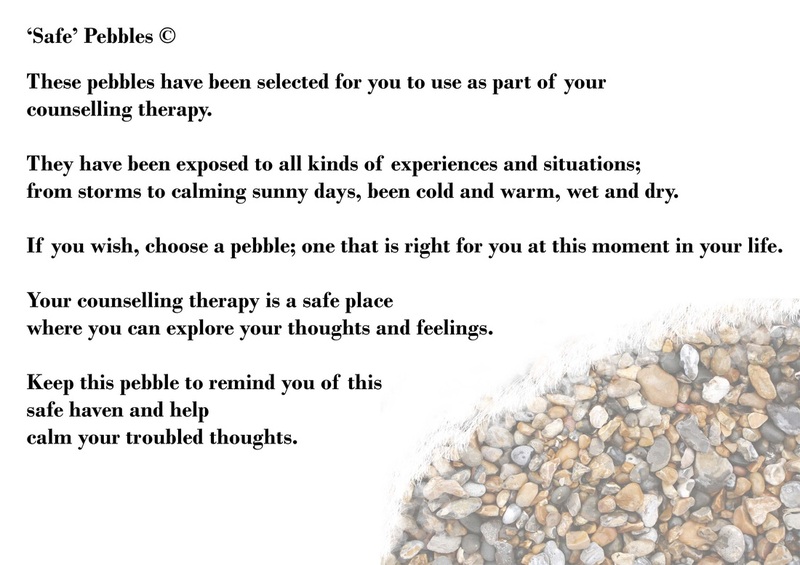 Here is an example of tactile therapeutic pebbles. Information and where to look can sometimes be very difficult to understand or seek out. At Counselling South Sheffield, we aim to make things simple for you and put you at ease from the moment you contact us.